Performance improvement of high-temperature superconducting (HTS) pancake coil is of paramount importance for its application in electrical facilities. 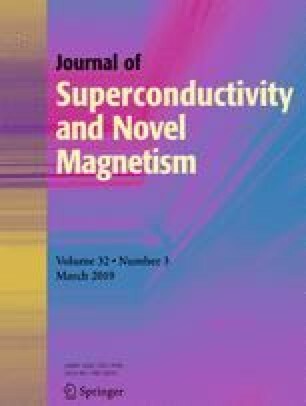 In this paper, the utilization of ferromagnetic disks including weak magnetic material and strong magnetic material is investigated through numerical simulations for the aim of reducing the AC loss. Both the nonmagnetic and magnetic substrates are considered for the rare-earth-barium-copper-oxide coated conductor tapes wounded into the pancake coil. In order to analyze the influences of ferromagnetic disks on the maximum allowable currents and AC losses of nonmagnetic substrate-based coil and magnetic substrate-based coil, a self-consistent model based on the A-formulation is adopted to calculate the critical current and a 2D axisymmetric model built on the H-formulations is established to calculate the AC loss. According to the simulation results, it is found that ferromagnetic disks especially the strong magnetic disk are slightly detrimental to the critical currents of the pancake coils. Nevertheless, the presence of large background field weakens the effects of ferromagnetic disks. The simulation results also indicate that strong magnetic disks achieve about 50% reduction of the AC loss in the nonmagnetic substrate-based coil, and the AC loss of the magnetic substrate-based coil can be increased or reduced with strong magnetic disks depending on the applied current amplitude. The utilization of strong magnetic disks leads to the enhancement of the AC loss in the magnetic substrate-based coil at lower current and to the reduction of it at larger current. The authors acknowledge the supports from the National Natural Science Foundation of China (nos. 11327802 and 11472120), 111 Project (B14044), the Fundamental Research Funds for the Central Universities (lzujbky-2017-k18), and the China Postdoctoral Science Foundation (no. 2017M610064).